Spidey Super Stories was a segment on a television show called the Electric Company that featured live-action Spider-Man stuff. If you want, you can see the appearance of the Beekeeper on the Youtube. To summarize: there is a villain named the Queen Bee who wants to conquer the world. Spider-Man is opposing her. 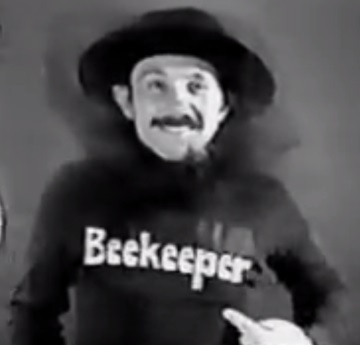 One of her henchmen is: The Beekeeper. Spider-Man beats the Beekeeper very easily. He seems like a relatively ordinary guy. Queen Bee and her other henchmen are some kind of half-bee people, and one of the bees in Queen Bee’s hive is named Fang and is said to be “poison” (I assume they mean “venomous”). But the Beekeeper is just a normal human, it seems. And henching? I mean, not to disparage henchmen, but that is definitely a step down from being a regular beekeeper. 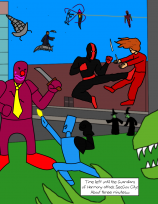 Issue #14 of the Spidey Super Stories comic adapts this story, and it isn’t much different. Queen Bee does once refer to him as “the Royal Beekeeper”, but that ain’t what it says on his shirt, so it surely doesn’t count. One Honeycombs out of Five. Man. I gotta find some more badass beekeepers sometime soon.